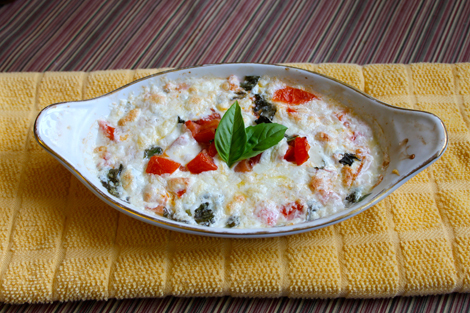 less is more: hot caprese dip. 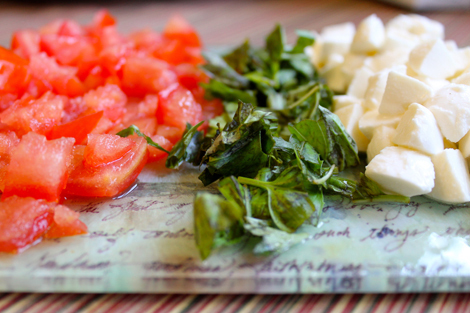 The first thing that Rich and I made off of my Pinterest to-do list: food edition was a hot caprese dip. I originally pinned this recipe from here, and have been saying I'd make it forever because it's only three ingredients. That's it! I mean throwing in a little bit of salt & pepper won't kill anyone, but it's really just tomato, basil, and mozzarella cheese. Perfection, if you will. // two vine tomatoes, or any type of tomato of your choice really. // 8-10 ounces of fresh mozzarella cheese. 1// chop everything into small pieces, and try to squeeze as much of the liquid from the cheese and tomatoes as possible, or the dip will retain water. 2// mix everything in a bowl with a sprinkle of salt and pepper, then put into an oven-safe dish. 3// Bake on 375* for 15 minutes, and broil for two minutes so the cheese gets a light golden brown bubbling on top. 4// Serve right away, and watch people from all over your neighborhood follow the heavenly scent to your kitchen. 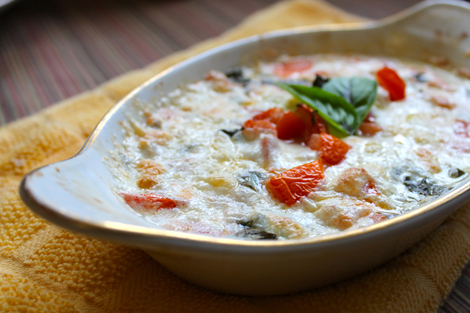 You might want to double or triple up this recipe if you're serving more than 3-4 people. This stuff goes, people.